Few days ago, a premium server SMS application for European users was big issue. The main reason of being attracted attention of that application was its range of infection. Recently, another variant of that has been reported. In this trend, great number of malicious applications will cover all over the world. INCA Internet Emergency Response Team can detect this and its variants and is updating. The damage case hasn't been reported in South Korea; however, we need to be careful on using this sort of applications. Using official Android market is the difference of former malicious applications. Of Course it can be downloaded from black market and 3rd party market. Earlier malicious application targeted 8 countries. But this is targeting 18 countries. This malicious application is inserted by various applications(Total 27apps) including "Games", "Wall Papers". 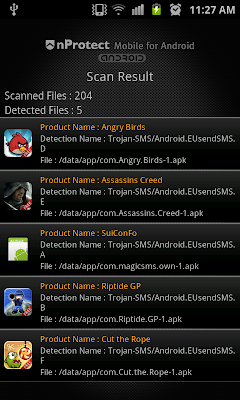 * List of malicious applications officially enlisted in Android Market. Because these malicious applications are disguised as a game or wall paper, general users can't detect it. This malicious application works same as former premium service SMS malicious application. But it tries to download additional APK file and install as following URL(This link has been blocked.). When the country code of infected smartphone is not among 18 countries above. Following figure is run screen. This malicious application is trying to download and install additional APK file, then it scans country code of infected smartphone. If the code is existed among those 18 countries, it will send certain message to victim's phone and will remove reply from premium SMS service provider as following code. To sum up, the biggest features of this malicious application are used Google's Android market, spreading targeting countries, and used various applications for its spreading. In case of this malicious application, it used social engineering technique for its concealment. I should say that this is a great article. forward to more insightful journalism like this! If you want to get useful writing information, just read https://eduessayhelper.org/blog/thematic-essay-writing. It was really helpful when I had to write my thematic essay. Great post with a great piece of information. This will be really helpful for my reference. Thanks for sharing. Awesome post with great content. You are providing us valid information. This is really helpful. Do share more such articles. Regards.